In light of recent media scrutiny on China, an opinion piece calls for a more careful distinction between Chinese authority and its people. "What is not clear," Simon Jenkins wrote last Friday [25 July 2008] of the Beijing Olympics, "is who will win, China or its critics". We all know what Simon Jenkins means: that China's Communist party leadership is winning the short-term race to host the Olympics on its own terms, but it may face trouble running the marathon – the longer-term struggle. I broadly agree with this analysis. But when we use the word "China" to refer to the small group of party leaders who wield power, then we play the Communist party's game. Saying "China" when what we mean is actually the tiny group of men who run the country is a shorthand that we've all used, myself included. Before you roll your eyes and accuse me of being picky, I would argue that it is extremely important now, in 2008, to make this distinction. It is the Communist party which has, very cleverly, for decades, worked to conflate the greater good, patriotism, nationalism and one-party rule. That is why western media coverage is judged both inside and outside China to be either "pro-" or "anti-" China, when in many cases the western media is simply telling it how it is, or telling it as well as it can, given the limits on access. Is Simon Jenkins in fact using the Communist party's own vocabulary when he describes recent western press coverage of China as "hostile"? More importantly, this use of an all-inclusive "China" is the most potent method of control that the leadership has over its own people. To raise questions about one-party rule – indeed to raise questions about pretty much anything – is to be "anti-China", a dissident. This year , China's Communist party has faced a perfect storm of stresses. Natural disasters have stretched relief capabilities to their limits, first in the snowstorms at lunar new year, and then in the devastating earthquake. Rioting by Tibetans against Han Chinese has laid bare one of the most sensitive areas of policymaking, both internally and in relations with the west. The Olympic games, which were intended to be China's moment of glory, are threatening to go sour. Grievances about price rises and official corruption have fed protests and, in some cases, riots in the provinces. Journalists cannot report, because they do not know, what effect this has had on the Communist party leadership, which shows a publicly united front. But it would be naive to think that everything is as harmonious in private. For those skilled in the science of China-watching there are tiny hints that might be cracks in the party response to these crises. China's modern political history shows periods of apparent stability disrupted by violent political rows at the top. I have lived in China for about 15 years on and off since I first went there in 1981. I was in Beijing until the end of June this year  (and will return there in August). My sense, as I spoke to people about the things that were happening, was that there were far greater differences of opinion than at any time since the demonstrations and massacre of 1989. I encountered angry anti-western sentiment, complaints that the west had not given enough aid to earthquake victims, complaints that western leaders who might boycott the opening ceremony of the Olympics were maliciously spoiling China's moment in the sun. I also encountered ordinary people – not people who would describe themselves as dissidents – who were furious with their leadership, who described as "stupid" their paranoia about Olympic security. 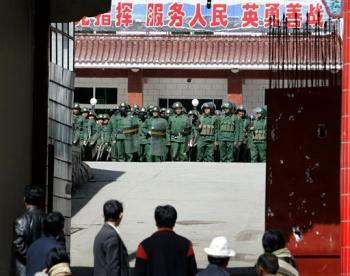 (In Beijing, a security threat might include someone wearing a "Free Tibet" T-shirt). I have heard people say, "Tibet has nothing to do with me, why should I care?". I have heard people rail against propaganda. I have met taxi drivers who get their news from the internet and who can discuss intelligently the differences between Tony Blair and Gordon Brown. In the past, the party exerted control through state-run work units which dispensed healthcare and education as well as birth control and wages. People's lives were absorbed into the sphere of party control. That has largely vanished. The carrot and the stick have gone, people's economic lives are basically their own, and party rule is now largely exerted through a combination of propaganda and damage limitation. My point is simply that we should be mindful now, more than ever, how we think and write about China. We must distinguish China the nation from the Communist party leadership which dictates policy. We must remember at all times that the Communist party is rarely united and that stability is often an illusion. And most of all we should remember that the vast variation in opinion among the ordinary people who make up China does not make up a monolithic will. The struggle, as it emerges, will not be between "China" and "its critics" – it will be the debate inside China itself.